Dhan Prapti means the accumulation of money and wealth; theYantra and mantra given in this post is a Dhan Prapti Yantra – Mantra Sadhana. This Yantra is prepared on any auspicious day falling on the 2nd Tithi [second day] of the Shukls Paksha [bright half of the Hindu Lunar Calendar]. The Yantra is prepared on Bhojpatra and written with the paste of Ashtagandha, by a pointed stick of the pomegranate tree. 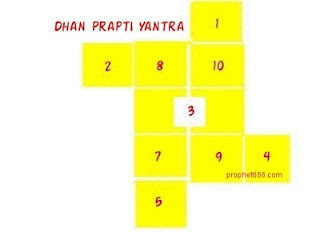 The Yantra is worshipped by offering it Haldi - Kumkum, incense and the lighting of a Diya. Then the Dhanprapti Mantra given here has to be chanted 1000 times and after that a Dashansh Havan [100 offerings] has to be done. The offerings for the Havan are Ghee [clarified butter], Sugar, Honey, Kheer and Bel leaves. The Pooja, Havan and the chanting of the mantra energizes the Yantra. TheYantra has to be then inserted in a gold or silver locket tied by a red or black thread and worn on the hand. Sir what is the meaning of this bhojpatra drawing? Thanks.